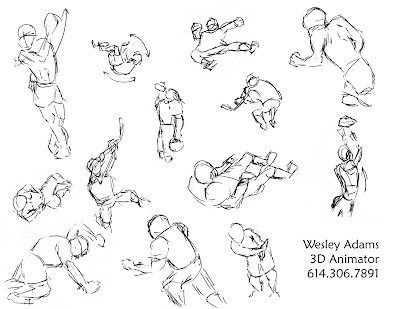 Here are a few sport poses. Great idea too. Really dynamic poses but had to draw pretty much from memory since the poses were so fast. I have some from football, hockey, and UFC or wrestling. I know. -_- I ran out of room. I was pretty upset about that. I will try to focus on exaggerating the poses and composition today. These look great, and your anatomy is holding well under the linework. Your sketchy style really helps push the movement in your pieces.